Off site construction refers to the manufacturing of structures at a different location from their final place of use. 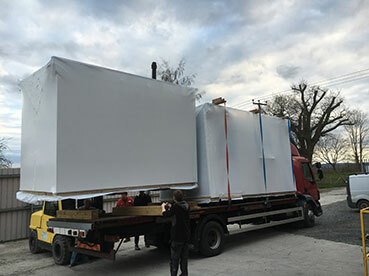 On long journeys by road or sea, the shrink wrapping of modular buildings stops damage which can be caused by extended exposure to weather and road grime. Unlike tarpaulins, shrink wrap fits tightly and fitted correctly, will not flap and detach, even at high wind speeds. 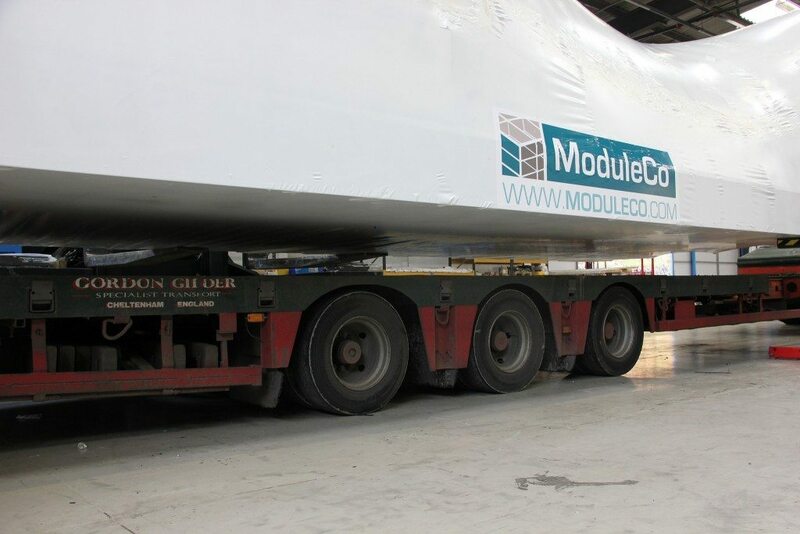 Traditionally, where modules need to be protected for road transport there are two solutions; The first method is to use general plastic sheeting which is battened around the edges of the module. This is a low cost option but it is difficult to fit this sheeting tightly so it tends to balloon at high speed and failure is not uncommon. As the consequences of sheeting blowing off a module on the motorway can be serious an alternative method is to use a re-usable cover. These tend to work better than general plastic sheet but can be expensive to purchase, required periodic maintenance and need careful monitoring to ensure they are returned from site after each use. 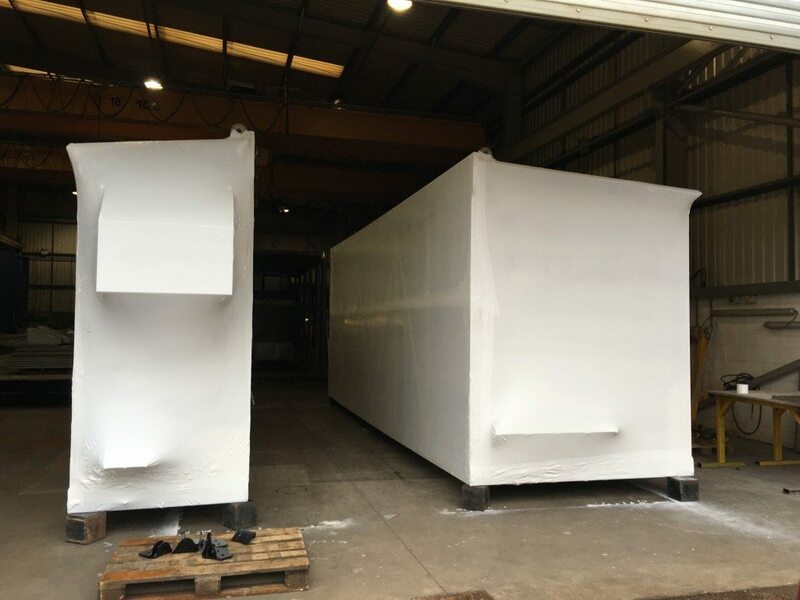 What are the benefits of a shrink wrap cover for modular / offsite applications? Tough - ‘shrink tight’ fit means covers will not blow off, even at motorway wind speeds. No maintenance, the covers do not need to be returned, easy to remove covering at site and recycle. Security - wrapped items deter opportunistic thieves and keep the item underneath hidden from view. 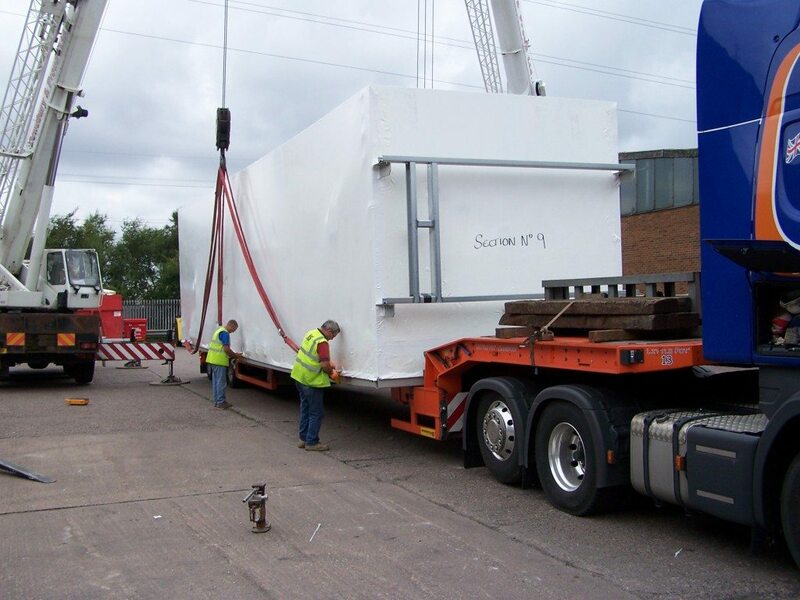 Where it is required that the open sides only of modules require sheeting the key challenge is to find a way to anchor the shrink wrap sheeting to the module so that when it is heat shrunk, the sheeting pulls ‘drum tight’. The most common technique is to secure a picture frame of batten around the module edge. Once the wooden batten has been installed the shrink wrap sheeting is hung using a second run of batten which sandwiches the film tightly. The entire sheet can then be shrunk ‘drum tight’. Using this technique, the entire module is completely encapsulated in an industrial shrink wrap film. The usual method is to start ensuring that any very sharp edges or corners have been padded with foam or similar. Next, a ‘footprint’ of shrink wrap film is laid out on the ground. This footprint is cut up to 1m larger than the footprint of the module which is to be shrink wrapped. The module is then lifted and placed on the footprint and the shrink wrap is pulled up and taped temporarily around the module sides. 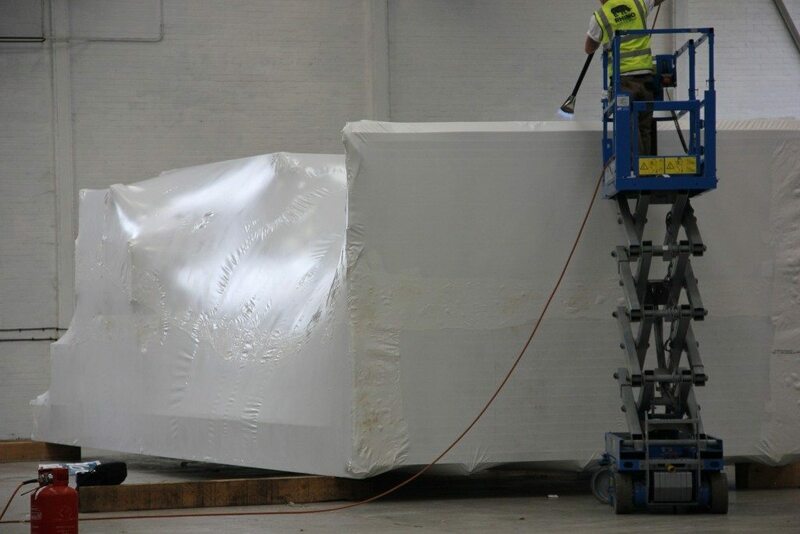 Shrink wrap sheeting is then unrolled over the roof of the module, cut from the roll and unfolded down each side. Using a hot air gun, the top sheet is heat welded to the ‘footprint’ along each side and the shrink wrap film is folded and heat welded at each end (in exactly the same way that you might wrap a large present!). Finally the entire module is heat shrunk ‘drum tight’. Generally speaking, it is not required that the roof be accessed for heat shrinking as a good quality shrink wrap film with a powerful and bi-axial shrink ratio will pull the roof tight once the sides have been shrunk. Although more shrink wrap material will be used with this technique, it can often be a quicker installation process then encapsulating an open side only because no time consuming drilling or physical fixing of the shrink wrap to the module is required. 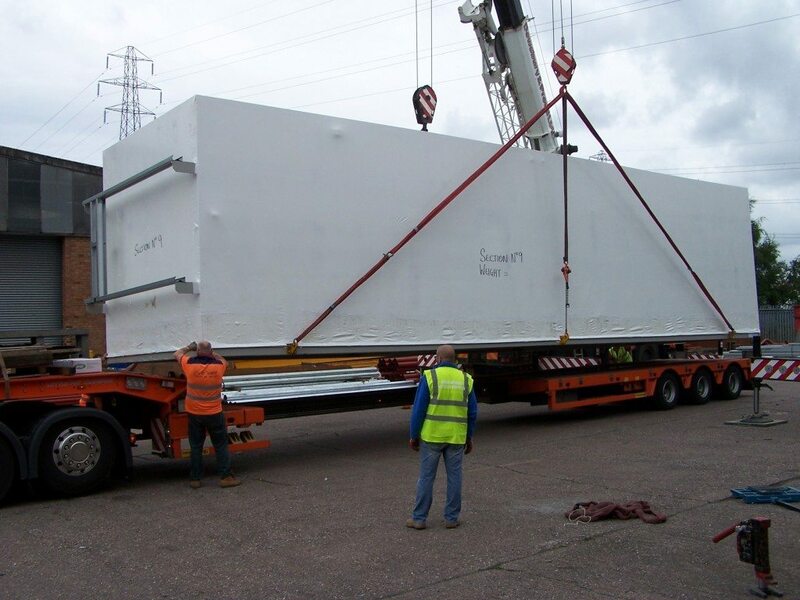 Where it is not possible to crane the module on to the shrink wrap footprint then it may be possible to run a band of webbing or a tensioned ratchet strap around the bottom of the module. So long as this band can be anchored at intervals to the module then the shrink wrap sheeting can be wrapped around this and heat welded to itself before being heat shrunk ‘drum tight’ as usual. Powerful and balanced shrinkage to ensure the cover fits ‘drum tight’ after heat shrinking. Strong welds – Welds need to stay bonded, even at motorway wind speeds. Flame retardant – EN13501. Some sites will only allow packaging that is approved to LPS1207 and 1215. Can you supply a non flame retardant film for shrink wrapping modules? Yes we can supply our Rhino Verisafe® 300 micron film in either a flame retardant or standard version.